WHAT IS IT? BATTLEDECKS OR POWERPOINT-KARAOKE. Participants will present a topic (provided just before they begin), for 3 to 3 and a half minutes, accompanied by 10-15 PowerPoint slides selected and arranged by our team of brilliant library scientists. No preparation required or allowed. Participants will be judged (aren’t we all) by equally as brilliant library scientists, based on a criteria ranging from the quantitative use of time and slides to the qualitative general composure and ability to address the topic. A certain amount of artistic license is expected from both participants and judges in their work. 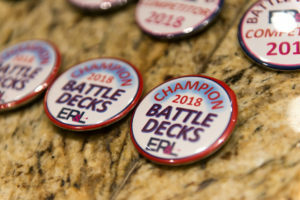 Battle Decks ER&L is Monday, March 4, beginning at 6:00pm immediately following the Vendor Reception & Tabletop Exhibit in the Exhibit Hall. Participants – Sign up early to secure your spot. We’re looking for up to 8 contestants. Volunteers – We’ll need a few folks on hand to help run the show as timekeepers, impromptu Picasso’s and wardens of security against the intense battles. If you are up for any of these roles, please contact Jesse Koennecke (jtk1@cornell.edu or @JayTeeKayOne) or sign up at the ER&L Registration Desk.